There is a scent in the air. Mingled with the brisk breeze of winter, it is the scent of victory; the aroma of tailgating grills alight with the fire of playoff football. This is the Winter Game Day Series, getting you ready to enjoy the best games with the best food. Next up is Smoked Pork Ribs With Asian Spice Rub, featuring Asian flavors and influences with a rich infusion of smoked wood. Full of bold flavor, heat, and tenderness, these ribs will add to the excitement of the big game. Using a preparation of three hours of smoke, then two hours wrapped in foil, then one more hour of smoke unwrapped, these ribs come off the grill moist, caramelized, and delicious. The dry rub is a combination of Chinese five spice, salt, ginger, garlic, pepper, and dry mustard that will yield into a tasty crust. The sweet and spicy sauce combines sweet red chili, soy sauce, red curry paste, sesame oil, roasted red chili paste, fish sauce, and lime juice. 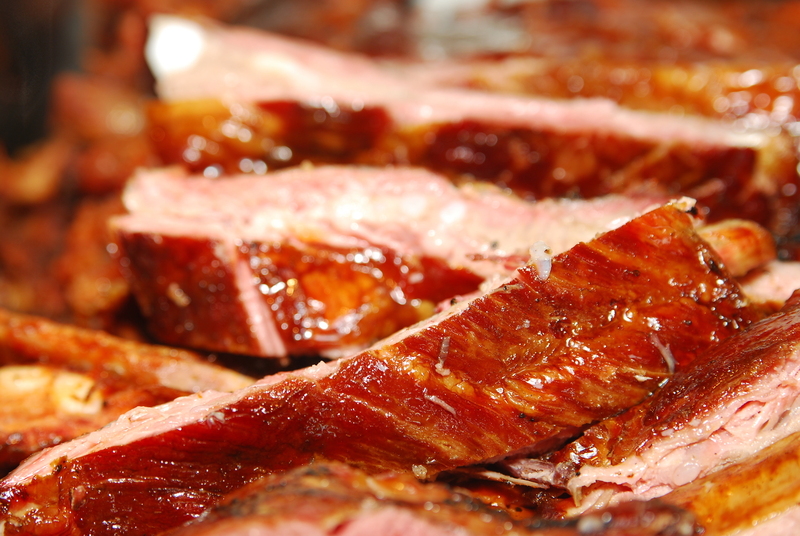 A spritz of water, apple juice, and apple cider is used o keep the ribs moist and sweet while smoking. There’s nothing like watching your team in a win-or-go-home game with terrific barbecue on your plate, so fire up the grill and let’s get ready for some football with the Winter Game Day Series. For the Ribs – I’ve used a rough 3-2-1 method for the ribs. The key is knowing when to identify the right time to move through the stages. What is the 3-2-1 method? It’s three hours of smoke, two hours wrapped, and one hour smoked again after removing the wrap. Preheat smoker to 250 degrees, for pork I like using a fruit wood. Prep the ribs by trimming excess fat and removing the silver skin on the bone side of the ribs. Use a sharp knife to separate the silver skin and a dry paper towel to get a good hold and pull off. Apply the mustard to the ribs as the base coating for dry rub, and then liberally apply your rub to the ribs on both sides. Place the ribs in the smoker. After 90 minutes begin spritzing the ribs every 15 minutes. Around the 2 ½ hour mark start looking for the bone to start poking through the rib meat. When you have roughly ¼ inch of bone showing, that is a good time to wrap the meat. Place each rib rack in its own aluminum foil wrap. Before enclosing, place 2 tablespoons of butter and 1 tablespoon of honey on each rack and then tightly seal the foil. After 90 minutes gently open the foil (caution – it’ll be hot, use oven gloves), use a toothpick or slender sharp knife to poke at the meat, you’re looking for it to go in like butter or to gently move the bones around, but not come out. If the meat is still not tender, re-wrap and check every 30 minutes. If tender, then open the foil completely and let cook for another 30 – 60 minutes to let the rich moisture evaporate some and set the ribs. Remove and then apply the sauce to both sides of the ribs, while reserving some to add as desired. Slice and serve (with a lot of napkins). Combine all ingredients, store in an airtight container, like a mason jar. Will last a few months. In a clean, food safe spray bottle (IE: Don’t use one that had cleaning solution!) combine all the ingredients. Combine all ingredients and stir. For heat, add cayenne.